Still hesitant about choosing the content management system? Look at a summary of all the good reasons why you should choose WordPress, including comparing with other popular CMS. According to statistics, WordPress drives over 25% of all websites, which makes it number #1 CMS (content management system). However, this does not mean that it must be the best solution for you or your client. Check out the main reasons why to build and not build a WordPress site. Find out if WordPress can do everything you need. You’ll also find out what’s better than in a competitive CMS, and where are shortcomings. The clean lines and detailed design is renome of every good architect whom clients choose to trust. If they have to choose, they need have enough information. And where else can you get it than on a representative web with a modern look! Take a look at the helpful tutorial that will lead you step by step through creating a WordPress Theme based site for an architect or architectural studio. Are you about to create a site for an architect and have you decided for WordPress? Great, you can make your work very easy. All you have to do is know what the site should be like and what goals it should meet. Due to the focus of the site, it is quite understandable that people with very high demands will be looking at it. You can not afford to show them a site that would be obsolete, unreliable or confused. Inspire with the minimalist template and some tips from our tutorial. Creating a WordPress site for an architect may not be complicated at all. Why does an architect need to build a website? Plugins extend the functionality of WordPress and allow you to make further changes to WordPress Settings. 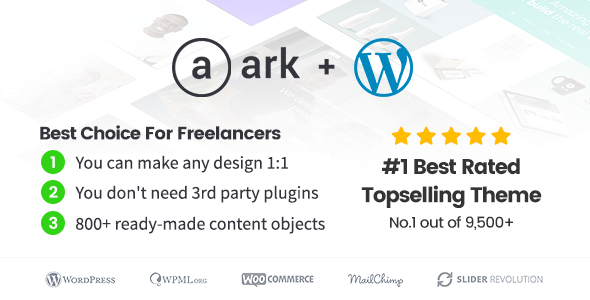 The five plugins listed below work well with the Ark WordPress theme for freelancers and it makes your site even better. Plugins which are also listed in the overview – Revolution Slider and Fresh Performance Cache are completely free of charge in the template Ark, and administration will automatically recommend you to install them. The smell of fresh coffee is the attraction only for the closest surroundings. But a functional and well-arranged web with important information which could capture the whole world. The website is a great way for every coffee shop to know and maintain relationships with customers. Do you know how to create such sites quickly and easily by using WordPress and any premium theme? If you are currently in the process of creating a coffee shop site and have decided to use WordPress, this article is a handy guide for you. Both coffee shop owners and freelancers will find useful info here. In this article, we will cover important aspects, that every coffee house website should taken care of. Then you can look at essential WordPress plugins and the process of launching the site itself. However we will not be discussing the hands-on technical aspect of creating a Coffee Shop website by using WordPress Theme here. We will rather give you lot of useful tips, what do you need to have on your website.